"Children of the world are innocent, vulnerable and dependent.They are all curious, active and full of hope. Their life should be full of joy and peach, playing, learning and growing.Their future should be shaped in harmony and co-operation.Their childhood should mature, as they broaden their perspectives and gain new experience. Abandoning the children, excluding good foundation of life for them, is a crime against humanity". 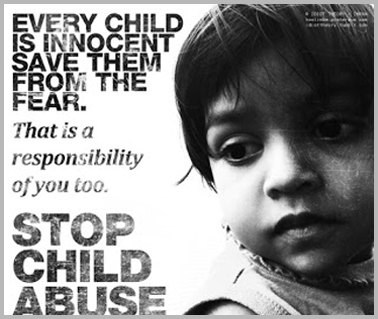 Child abuse has become a regular phenomenon in our country.Be the child a boy or girl, it is immaterial. It is astonishing that the child even gets abused in his/her own family where the child would have been more secure and safe.The abuse and sexual exploitation is so rampant in our society that it has degraded the society and threatened the physical and psychological integrity of a child.The children get abused and exploited in such a tender age that they are unable to understand what is taking place with him or her, in an age where the child is too young to give his consent for the purpose. Ministry of Women & Child Department Government of India. Women & Child Development Department Government of Odisha.